On a cool breezy Sunday morning, June 25, 2017, the Consulate General of India in Atlanta in collaboration with the City of Sandy Springs and 50-plus community organizations celebrated the 3rd International Day of Yoga (IDY 2017) at Heritage Park, Sandy Springs, from 7:30 am to 10:30 am. 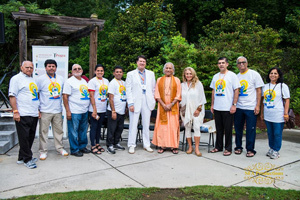 Consul D. V. Singh (Head of Chancery), Mayor Rusty Paul of Sandy Springs, Gurudev Amrit Desai of Amrit Yoga, and Shri Saumitra Gokhale, Global Coordinator, Hindu Swayamsevak Sangh USA, inaugurated the event, which was attended by over 700 yoga practitioners from all walks of life. Around three hundred million people are practicing yoga asanas, pranayama, meditation, etc. worldwide, including one hundred million in India. The United Nations General Assembly declared June 21 as the International Day of Yoga, following Indian Prime Minister Narendra Modi’s address to the UN General Assembly on September 27, 2014, wherein he stated, “Yoga is an invaluable gift of India’s ancient tradition. It embodies unity of mind and body; thought and action; restraint and fulfilment; harmony between man and nature; a holistic approach to health and well-being. It is not about exercise but to discover the sense of oneness with yourself, the world, and nature.” The International Day of Yoga is celebrated annually the world over by Indian Consulates in collaboration with other organizations. The enthusiastic and cheerful attendees rolled out their yoga mats and joined in performing the Common Yoga Protocol followed at the IDY. Led by a few seasoned yoga volunteers, they did warm up practices; standing and sitting asanas (postures); prone and supine asanas; kapalabhati and pranayama (breath altering practices); dhyana (meditation); and sankalpa (commitment to the truth).This was followed with Yoga Namaskar, Hatha Yoga, Surya Namaskar, guided meditation, and songs and dances for peace. Students of Nritya Natya Kala Bharti Dance and Music Academy presented a scintillating Kathak fusion item, which signified the strength and importance of the sun to yoga and dance. The program concluded with the closing invocation. 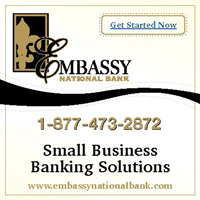 The event was supported by contributions from various business and professional entities including Kroger, Austell International Farmers Market, Suvidha, and Simsam LLC. The following organizations put up their booths: Sewa, HSS, Amrit Yoga, Sahaj Yoga, Isha Yoga, Art of Living, Heartfulness Meditation, and Raksha along with many individuals. More than 100 volunteers put enormous efforts to make this program a grand success. 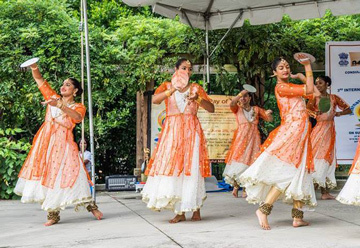 The India Consulate–Atlanta and Sudhir Agarwal, Rajan Vedak, Ajay Houde, Rajeev Menon, and Jaideep, to mention a few, did a commendable job in ensuring a flawless and memorable celebration of the 3rd IDY.